WordPress 3.7 is out and there are some cool new features in it. This release is mainly focused on improving security and stability of WordPress. One such improvement is the auto update system. Since 3.7, a typical WordPress install will now be able to automatically update itself when there is a new minor/security release available without any user input. For example, it will automatically update itself from WordPress 3.7 to 3.7.1. Auto updates are not enabled by default for major releases like 3.7.1 to 3.8. 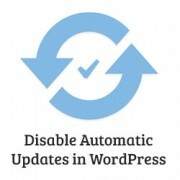 In this article, we will show you how to disable automatic updates in WordPress. On managed WordPress hosting, the host usually takes care of automatic updates for users. But now with WordPress 3.7 this functionality will be available to all WordPress users. The problem is that some of them may not be ready for it yet. Despite warnings many users make modifications to WordPress core which may not be compatible with automatic updates and could affect their WordPress sites. There are also users who run WordPress for clients and have their own ways to update WordPress when a new version is available. Lastly, there are users who just want to do their updates manually and have more control over it. Please note that even though you can disable automatic updates, it is still highly recommended that you update your WordPress install to the latest version as soon as possible for better security.